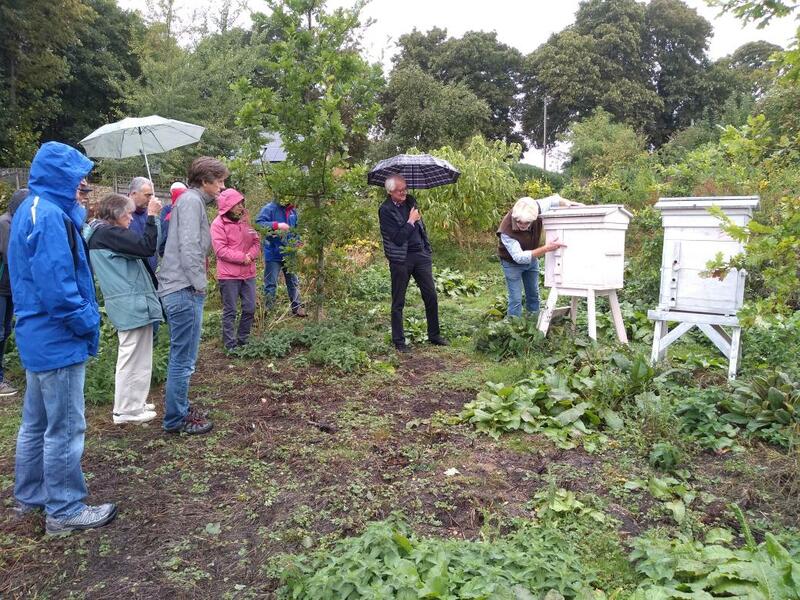 At the end of August the world’s first major international gathering of natural beekeepers, Learning from the Bees, took place in the Netherlands. The atmosphere had a festival vibe and concentrated on healthy bees and improving the environment, rather than the commercial / honey emphasis of most major bee events. The subject that kept coming up was natural selection. Presentations ranged from research scientists like Professor Tom Seeley (famous for his studies of wild forest bees in America) and Peter Neumann (molecular geneticist, President of COLOSS) to environmental activists like Terry Oxford (US pesticide campaigner), Deborah Post and Tom van de Beek (planting / education initiatives in Holland and Germany), and well known authors like Jacqueline Freeman. There were also artists and poets, reminding us of the impact of bees on human cultures. Gareth checks state of Einraumbeutes (Golden Hives) with finger in entrance. One has cork insulation, the other is a control. 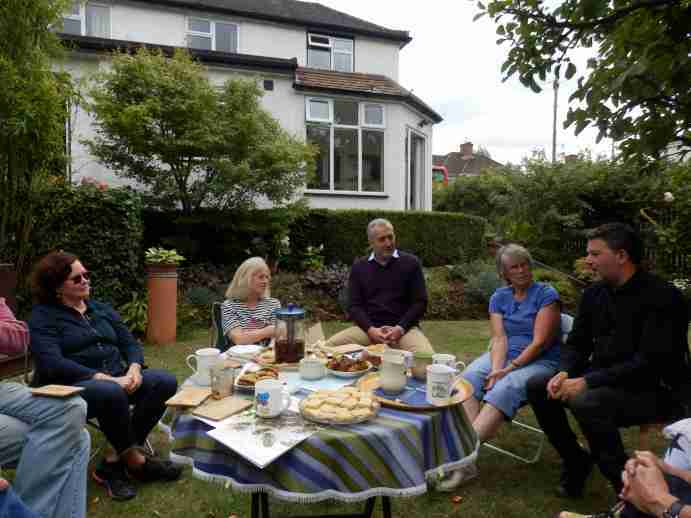 16 beekeepers clustered at Gareth’s house (warm and dry) and his experimental apiary (damp and chilly) to discuss bees and eat cake. 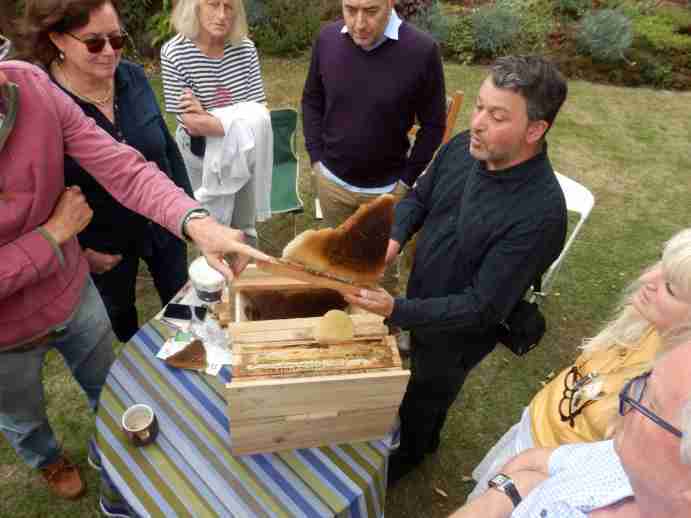 Gareth, who’s kept bees since at least the 1970’s, recounted experiences from the recent Learning for the Bees conference in the Netherlands, where he was an invited speaker and moved several grown men to tears. He showed us his experiments with hive entrance positions, Golden Hives (Einraumbeute) and hybrid Warre-Einraumbeute styles, cork insulation, easier honey harvesting, and answered a mass of questions on hive design, wasps and varroa. The wasps probing my hives are being put off by masses of guard bees at the entrances. Watching the way they approach then suddenly veer off, I was struck by this pile of living bees at the entrance to hive 3. 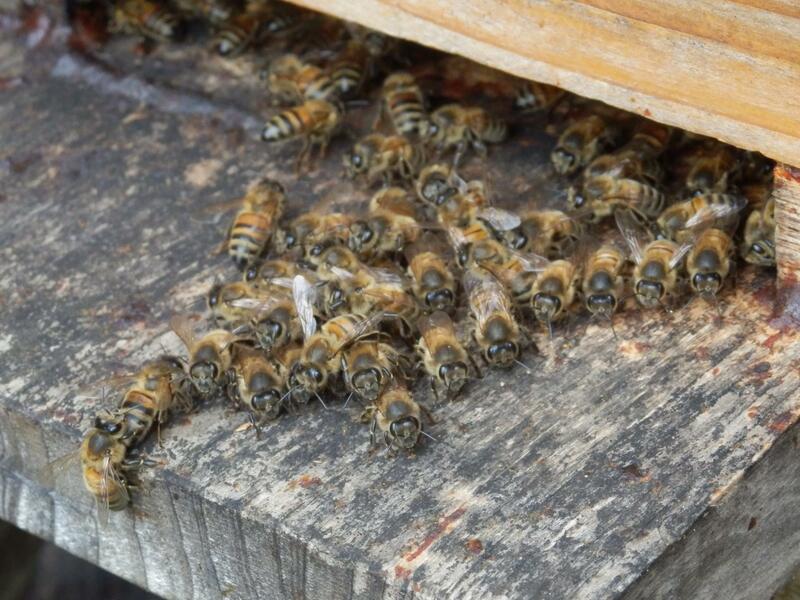 These bees are all alive, and they seem calm and happy – no struggling. But why are they piled up in a heap? They keep the guards warm! Warm bees can launch into the air immediately. On cold days, bees need to sun themselves a bit before taking off. They add to the apparent numbers of guard bees. Fooled me, probably fool wasps. A deterrent. 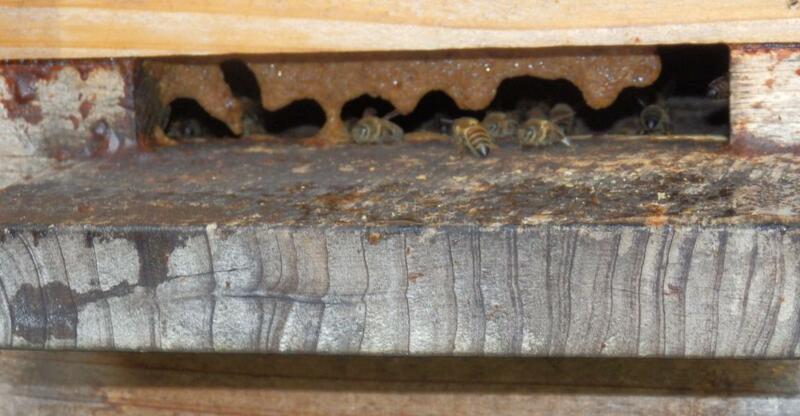 It’s odd that this is the only one of the 4 hives that does this though. Today I rechecked. It’s colder, earlier in the day and there is a bit of rain so the guards (and wasps) were not yet present, but I noticed something else different about hive 3, which its neighbours lack – they’ve built an entrance reducer. Unlike other times I have seen this, the colony is strong, and it is not under attack. There is one other thing worth noting here. A couple of the bees are holding their wings out in a V. I’ve seen this with a few other bees on this hive’s landing board recently. It’s a sign of a viral disease, but there’s nothing I can do about it so I am leaving them to sort it out. One way bees do this is that bees which feel unwell instinctively leave the hive to die outside, and the queen lays replacement eggs. They only live a few weeks anyway and the queen can lay 1500 eggs a day; so whilst ruthless, this slight speeding up of the egg production line is efficient at removing infection. It’s interesting that as soon as the ivy started flowering here, the wasp attacks ended. It is easier to get nectar from ivy than steal honey from a defended hive. I assume they will return later in the season, as other food supplies disappear. The ivy is densely covered in wasps, flies, hoverflies, I even saw a hornet. Yet the wasps are not attacking the other insects. Now they have finished raising young, their priority is not protein, but keeping their bodies going with carbohydrates. There are no honeybees on the ivy. Bees forage up to 3 miles from the hive, I think they have found a better food source: they only seem to forage on ivy as a last resort. It forms poor quality honey, which crystallises rock-hard in the cells. Wasps and small flies have a short flying range – wasps are very territorial and risk fights if they go into other nests’ territory – and have to forage on what is nearby. 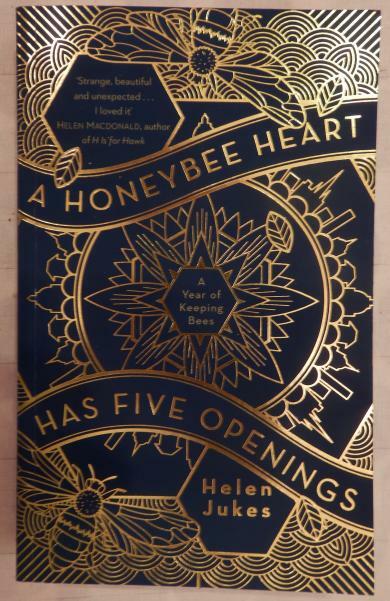 A Honeybee Heart has Five Openings is a book by Helen Jukes, a member of our group while she lived in Oxford. Autobiographical in nature, it describes a period when she was generally rootless and dissatisfied with how her life and career were unfolding, until some friends gave her some bees. Caring for these made her reflect on her own life, and this ultimately led to a much happier balance for her. 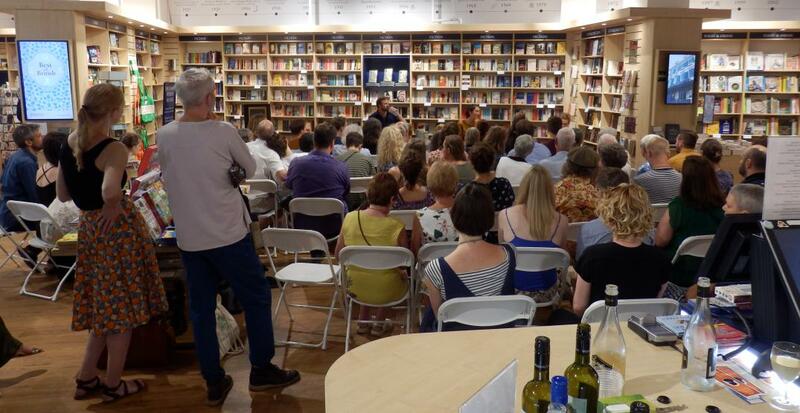 The book was launched on 26th July at Blackwells in Oxford and Jack, Gino and I went to the event, where Helen spoke to 50-60 people, reading some passages, answering questions from the audience and being interviewed by writer Nick Hunt, who described the work as ‘humble and full of joy’. I particularly liked her equating a hive with a symbol of a house / home. 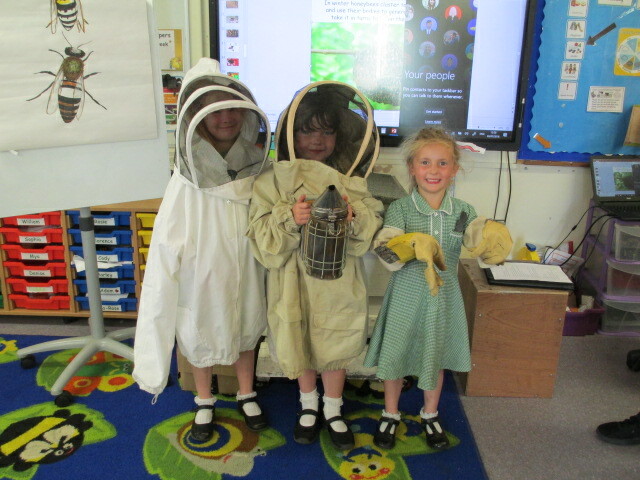 In May Sutton Courtenay Primary School asked us if there were any ONBG members willing to do a presentation on bees for its Year 1 and Year 2 children. I live in an adjacent village and had just caught a swarm not 100 yards from the school, so I could hardly refuse.